My site for my Grandmother Olive was made with all the love and compassion that was given to me by this very special person that will forever be in my heart. My parents have always been a huge inspiration to me. They have given me the ability to have the insight to appreciate love and the importance of family. We have been through a lot together in our lives, and we never forget that. Thank you mom & dad for the knowledge and insight. The love that I have for my grandmother will never be compromised by anyone or anything. Nobody in this world living today can quite understand her the way that I had the opportunity to. With the extra time that I had the opportunity to spend with her, I became more than just a grandchild, but a real friend and equal. In our busy lives of today, we rarely have the opportunity to fully appreciate our family for what they are. Sometimes, we don't realize it until it is too late. By spreading a little of the love that was shown to me at a very tender age, I can only hope that I will allow if even just one child or grandchild to pay a little extra attention to their parent or grandparent. You can learn more from just one grandparent than you ever could by a thousand books. My hope is to make sure that we embrace our elders while we still have them here with us. Before you know it, they will not be around to tell the stories of yesterday. That is a waste. Just remember: Grandparents have seen it all. Don't underestimate their powers of understanding. Don't wait till they are gone before you realize what you have. 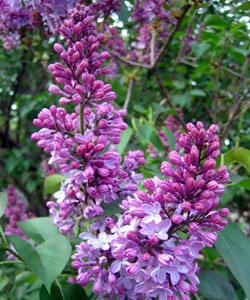 Grandma loved lilacs more than any other flower.